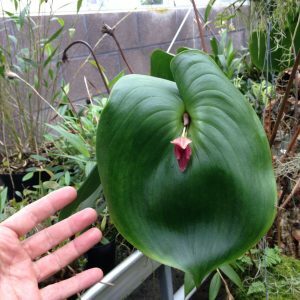 This fabulous orchid is a real oddity with its very large (40cm diameter) lily pad like leaves on 90cm long stems. 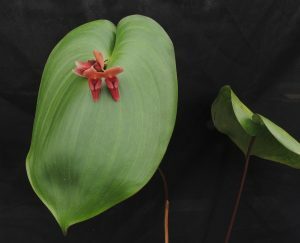 The flowers are the largest of any of our pleurothallis though they are quite small for the size of the plant. 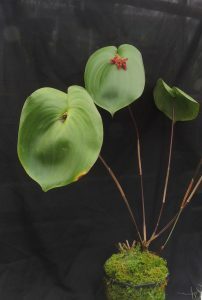 A real bonus is the plant’s habit of flowering several times each year. 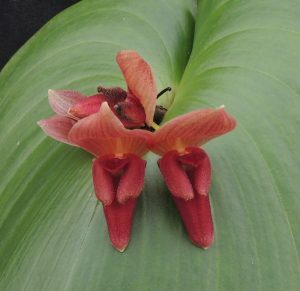 The species comes from around 2000m altitude in Ecuador where it grows as an epiphyte in dense forest. Our experience in cultivation is that it likes to be wet enough for moss to grow on its basket(see above), cool (minimum 12C) and shaded to avoid its large leaves overheating – heat stress causes premature yellowing of the leaves and leaf drop. The photo we took last year gives a good idea of the leaf size.